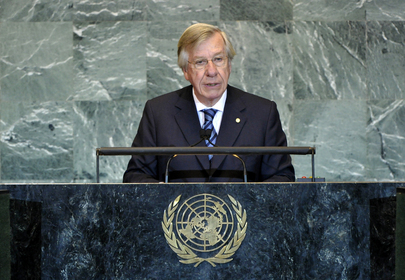 DANILO ASTORI, Vice-President of Uruguay, said that the principles of international law and the strengthening of multilateralism were not only a moral imperative, but a legal obligation for all States. Welcoming South Sudan, he also noted that Uruguay had, in March 2011, recognized the State of Palestine. It believed that all the necessary conditions existed for that recognition to become universal and for the two-State solution, supported by Uruguay since 1947, to become effective. The Palestinian people had a legitimate and full right to constitute itself as a State; meanwhile, the Jewish people had the undeniable right to live in peace, inhabiting a safe country free of terrorist attacks. Additionally, he said, Uruguay rejected all coercive measures that violated the principles of the United Nations, such as the economic, trade and financial blockade imposed by the United States against Cuba. Uruguay was grateful to have been chosen to chair the Human Rights Council. In the course of that mandate, he said, it intended to promote a new culture of dialogue on human rights – one which favoured cooperation not only between States, but also between the international system and States that needed assistance to improve their human rights situations. It also hoped to improve the procedures and the application of the Council’s instruments in a non-selective manner and one that avoided double standards. Uruguay understood that mass atrocities such as genocide, war crimes, crimes against humanity and ethnic cleansing could not be ignored. Always keeping in mind the principle of non-intervention in internal affairs, it acknowledged the State’s primary responsibility to protect its population, as well as the importance of fostering cooperation with States that might require assistance to fulfil that obligation. With approximately 30 per cent of its operational defence forces devoted to United Nations peacekeeping operations, Uruguay was the main troop contributor as a proportion of its population, and ranked tenth in absolute terms. It was convinced that the sustainability of those missions would be impossible unless the resources for their operation were seriously reconsidered, and the conditions offered were updated, both in terms of equipment and human resources. Further, it was committed to the strictest enforcement of mandates on the conduct of field personnel; in cases where unacceptable misconduct had occurred — such as that carried out by five members of Uruguay’s military in Haiti — Uruguay had not hesitated to act “with the utmost severity and rigor”. Those individuals had been prosecuted by military justice and sentenced to prison terms. The case has been passed on to the civil justice system as a criminal case. While respecting due process and the utmost transparency, his Government would stop at nothing to uncover the truth and sanction those responsible. Regarding mediation and preventive diplomacy, there could be no doubt that the United Nations was the natural place for such work. However, it could not be ignored that, in practice, that must be complemented by the actions of regional entities and even by countries acting individually. Uruguay, therefore, supported a larger investment of efforts and resources in the development of such activities. In the area of climate change, changes in production schemes would be necessary; Uruguay also considered it essential that progress be made in the field of the negotiations on chemicals, particularly mercury. Further, he continued, the world economy and development were undergoing huge transformations. Developed countries faced serious difficulties in recovering from a deep economic crisis; emergent economies were playing a role in setting the direction of the world economy; and the need to establish new regulations and global agreements had become more apparent. In that context, peace and stability could not be achieved without sustainable development. It was essential that the upcoming “Rio+20” conference reach tangible benefits for Uruguay’s citizens, he stressed. For that to happen, it would be necessary to approach issues related to technology transfer, technical training and financing for developing countries. Uruguay was particularly concerned with the lack of progress in the negotiations of the Doha Round of the World Trade Organization. It was essential to eliminate agricultural subsidies, which forced countries that were once self-sufficient to import a large amount of what they consumed. Stimulating investment to increase production and improve productivity, a successful completion of the Doha Round, as well as the transfer of adequate technology to developing countries, were fundamental to obtaining food security, he said. Uruguay, as a middle-income country, reiterated the need to discuss a “new cooperation modality or scheme” that took into account the specific development needs characteristic to such countries. It was committed to the reform process of the United Nations. It believed that improving global governance was first a domestic issue, within the United Nations system, and was, therefore, satisfied with the results of the Delivering as One Pilot Programme. Additionally, Uruguay was seeking to hold a non-permanent seat on the Security Council in 2016-2017.